Fig. 155 Product characteristics/attributes model . a THEORY OF CONSUMER BEHAVIOUR that shows how CONSUMERS choose between a number of BRANDS of a product, each of which offers particular product characteristics in fixed proportions. For example, consumers buying blackcurrant juice may be looking for two principal product characteristics - flavour and vitamin content. Three brands of blackcurrant juice are available - Brand A, Brand B and Brand C - each of which is differentiated insofar as it places a different emphasis on the two product characteristics. The three brands are represented by the rays in Fig. 155, which show the fixed proportions of product characteristics in each brand. Brand A, for example, has a high vitamin content but has little flavour while Brand C, by contrast, has a lot of flavour but a low vitamin content. Points a, b and c on these rays show how much of each brand of juice can be bought for a given unit of expenditure at the prevailing prices of the three brands. To find the consumer's utility-maximizing brand purchases, it is necessary to introduce a set of indifference curves, I1, I2 and I3, showing the consumer's preferences between the two product characteristics. The consumer's final choice will be brand B, as he settles at point b on the highest indifference curve (I3) consistent with his limited expenditure. 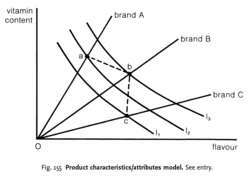 See CONSUMER EQUILIBRIUM, INDIFFERENCE CURVE, PRODUCT DIFFERENTIATION.